Have you set a budget for your job search? Interview expenses, along with the length of a job search, can have major financial impacts. 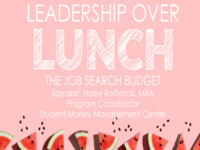 Attend this lunchtime discussion to learn how you can prepare for the job search and come out with your wallet intact! Lunch will be provided on a first-come, first served basis. For more information, please contact the Department of Leadership Initiatives at 936-294-3000 or leadership@shsu.edu; or visit our website.